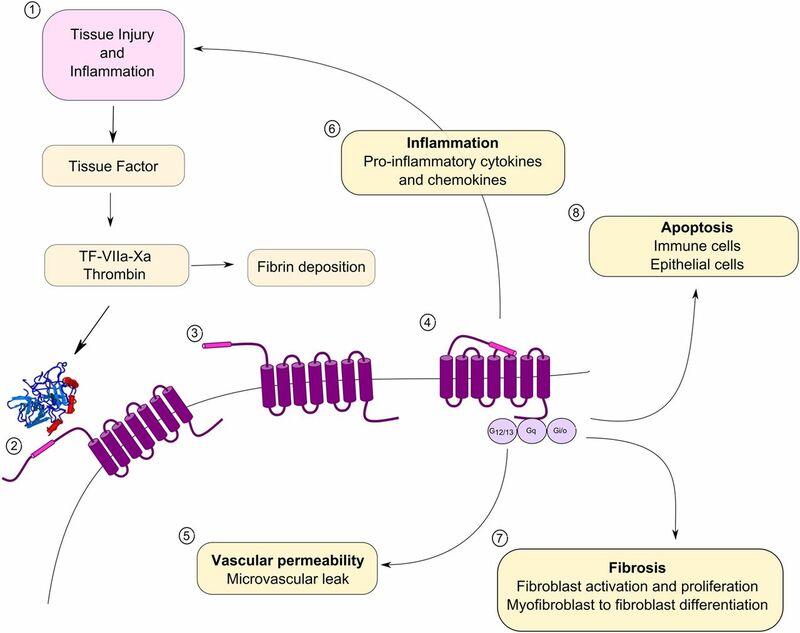 The coagulation cascade plays a central role in the pathogenesis of fibroproliferative lung diseases such as the acute respiratory distress syndrome (ARDS) and idiopathic pulmonary fibrosis (IPF) through multifaceted effects on haemostasis, inflammation and tissue repair. However, targeting the coagulation cascade using traditional anticoagulant approaches has not resulted in improved outcomes for these patients. The cellular effects of the coagulation cascade are mediated via a family of four proteinase-activated receptors (PAR1–4). PARs are G protein-coupled receptors that have a unique method of activation involving proteolytic cleavage. They play key roles in mediating the interplay between coagulation and inflammation and tissue repair and fibrosis. Current evidence suggests a central role for PAR1 and PAR2 in influencing these responses, although data from animal models suggest that their contribution is highly dependent on both the nature of the insult and disease status. Nonetheless, these receptors may represent important targets in conditions associated with uncontrolled coagulation signalling responses including IPF, ARDS, asthma and chronic obstructive pulmonary disease. PARs are seven-transmembrane G-protein coupled receptors with a unique mode of activation involving limited proteolytic cleavage at the extracellular N-terminus and the unmasking of a cryptic tethered ligand. The tethered ligand interacts with the second extracellular loop of the receptor to initiate cell signalling via the recruitment of heterotrimeric G proteins of the G12/13, Gq and Gi/z subfamilies to the fourth intracellular loop of the receptor (figure 1). There are four PARs (PAR1–4), and collectively the proteinases of the coagulation cascade can target all four family members. Thrombin is a major activator of PAR1, PAR2 and PAR3 whereas coagulation factor Xa, on its own or as part of the TF-FVIIa-FXa ternary complex, activates PAR1 and PAR2. Other important activators of PAR1 include activated protein C (APC) and matrix metalloproteinase-1 (MMP-1), whereas trypsin and tryptase activate PAR2 and trypsin and cathepsin G activate PAR4. In terms of eliciting downstream signalling responses, PAR1, PAR2 and PAR4 can signal autonomously while PAR3 is mainly considered to be a co-receptor for PAR1 and PAR4. Coagulation–inflammation cross-talk. (1) Tissue injury and inflammation lead to activation of the tissue factor (TF)-dependent extrinsic coagulation pathway and the generation of thrombin that converts fibrinogen to fibrin. (2) Thrombin cleaves the N-terminus of the proteinase-activated receptor (PAR1) to unmask a tethered ligand (3) that can initiate signalling via interaction with the second extracellular loop (4). This leads to differential signalling via the recruitment of heterotrimeric G-proteins and downstream cellular responses leading to increased vascular permeability (5), inflammation (6), fibroblast proliferation and myofibroblast differentiation (7) and cell apoptosis (8). With regard to lung injury and inflammatory responses, most attention has focused on PAR1 and PAR2. These receptors are expressed on alveolar macrophages, fibroblasts, pulmonary epithelium and pulmonary endothelium. Furthermore, cells recruited to the lungs during inflammatory and tissue repair processes such as neutrophils, monocytes and platelets also express PAR1–4. Activation of PARs has multiple effects depending on cell type and the nature and concentration of the proteinases within the tissue microenvironment. This is most evident in the vasculature where PAR1 is highly disruptive to barrier function following activation by high thrombin concentrations or by MMP-1. In this context, PAR1 signalling promotes endothelial cell shape changes and cytoskeleton reorganisation. Conversely, activation of PAR1 at low thrombin concentration or APC leads to anti-inflammatory responses and protection of endothelial barrier integrity.2 However, in the context of lung injury and sepsis, thrombin responses will likely predominate over APC responses as thrombin has a much higher affinity for PAR1. Moreover, the role of PAR1 during these responses has also been reported to be temporally regulated, and PAR1 has been shown to switch from being barrier disruptive to being barrier protective during the progression of experimental endotoxaemia.3 In addition to influencing endothelial barrier function, PAR1 promotes the release of potent proinflammatory mediators and chemokines including interleukin (IL)-1, IL-2, IL-6, IL-8, tumour necrosis factor α (TNFα) and CC chemokine ligand (CCL)2, and further influences inflammatory cell trafficking by increasing the expression of adhesion molecules such as E- and P-selectin and ICAM-1 on the endothelial surface.1 Several of these mediators (eg, IL-6, TNFα) can further induce TF expression, which leads to further generation of thrombin at local sites of inflammation and thereby induces a positive feedback that maintains the interplay between coagulation and inflammation. PAR1 influences tissue repair and fibrogenic responses by stimulating endothelial cell and fibroblast proliferation and by promoting fibroblast to myofibroblast differentiation.1 As is the case for PAR1, PAR2 is highly expressed by the vascular endothelium where it can mediate both vasoconstriction and barrier protective effects. In terms of regulating inflammatory responses, PAR2 is both pro- and anti-inflammatory and has been most closely linked to inflammatory airway disease. PAR4 has also been demonstrated to play a role in mediating neutrophilic inflammation in an animal model of sepsis. Levels of TF, D-dimer and thrombin are elevated in the bronchoalveolar lavage fluid of patients with acute respiratory distress syndrome (ARDS), indicating active ongoing activation of coagulation pathways.4 ARDS is also associated with intra-alveolar fibrosis which, in most cases, resolves completely; however, the degree of initial fibrosis has been shown to be a key predictor of outcome. The inflammatory and coagulation responses are considered to be protective to the host, particularly in the context of infection, but excessive coagulation and inflammation can lead to augmented tissue injury with disruption of the alveolar-endothelial capillary barrier and the accumulation of protein-rich fluid in the alveolar spaces. In addition, excessive deposition of intra-alveolar fibrin and protein-rich hyaline membranes impair gas exchange and contributes to hypoxaemia. Whereas current evidence suggests a key role for PAR1 in experimental models of ARDS,5PAR2 does not appear to play a critical role in promoting lung injury in animal models of intratracheal Escherichia coli, bleomycin or acid injury. In contrast, PAR1 signalling influences several key features of ARDS including neutrophil recruitment, alveolar leak and fibrosis in lipopolysaccharide and bleomycin-induced lung injury.5 ,6 In terms of alveolar leak, this is likely mediated as a result of direct effects of PAR1 leading to disruption of alveolar barrier function, but also as a result of the release of neutrophil chemokines which, in turn, influence neutrophil recruitment and consequent bystander tissue injury. The role of PAR1 in promoting fibrotic responses will be discussed further in the context of pulmonary fibrosis, although fibrotic effects elicited by PAR1 are also pertinent to ARDS. Even though traditional systemic anticoagulant therapeutic approaches have been unsuccessful in translating animal findings to human ARDS, there is little doubt that intra-alveolar coagulation plays a major pathogenic role in this disease context. Whether targeting PAR1 would offer an alternative strategy to interfere with excessive coagulation signalling responses in ARDS remains to be tested. Current data suggest that the nature of the insult, disease status and the timing of presentation are likely to be critical determinants of a successful PAR1 targeted approach. It is also worth commenting on the disappointing results of the ACE-IPF trial, a placebo-controlled randomised trial of warfarin in IPF which was halted early due to excess risk of mortality in the warfarin treatment group.11 It is very important to appreciate that warfarin inhibits the production of all vitamin K-dependent coagulation factors with multifaceted consequences on haemostasis and subsequent tissue injury responses. The specific inhibition of PAR1 would therefore potentially offer an opportunity to selectively interfere with deleterious coagulation signalling while preserving the essential role of the coagulation cascade in promoting haemostasis. This might be critically important in the context of IPF where there is ongoing chronic microinjury. Asthma and chronic obstructive pulmonary disease (COPD) are also associated with airway remodelling and activation of the coagulation cascade, with evidence of increased levels of TF and thrombin in airway secretions from these patients. Both PAR1 and PAR2 are expressed on airway smooth muscle, and thrombin activation of PAR1 leads to the constriction of human bronchial rings in vitro and mucin secretion from primary human bronchial epithelial cells. In a murine model of neutrophilic inflammation induced by N-formylmethionyl-leucyl-phenylalanine (FMLP), PAR1 signalling promoted goblet cell metaplasia and excessive mucus production, both of which are hallmark features of asthma and COPD. Furthermore, PAR1 activation by thrombin has been shown to promote airway remodelling by inducing the expression of TGF-β1 in ovalbumin-allergic rats. It is also worth commenting that PAR1 signalling responses in the vasculature may be linked to increased cardiovascular-related mortality in patients with COPD. PAR1 is upregulated in arteriosclerotic lesions and PAR1 antagonists reduce the risk of cardiovascular-related death and ischaemic events in patients with arteriosclerosis.13 Future studies to evaluate PAR1 antagonists as a potential adjuvant therapy in this setting may therefore be warranted. However, caution will need to be applied to patients on dual antiplatelet therapy as systemic PAR1 antagonists also target platelet aggregation and may therefore increase the risk of intracranial bleeding.13 The local delivery of such agents directly to the lung may reduce the risk of systemic side effects but, to the best of our knowledge, there are currently no inhalable PAR1 antagonists in development. Modulating pathways involved in coagulation and fibrinolysis results in complex effects on haemostasis, inflammation and tissue repair, and anticoagulant treatment strategies may increase the risk of bleeding and/or potentially compromise host defence. To date, anticoagulant treatment strategies have not been successful in improving outcomes of patients with pulmonary fibrosis or ARDS. Targeting the cross-talk between coagulation and inflammatory and profibrotic pathways by antagonists or antibodies directed at either PAR1 (or possibly PAR2) may in the future lead to improved outcomes. Several PAR1 small molecule antagonists are currently at an advanced stage of clinical development in the setting of cardiovascular disease and may offer promise for future evaluation in lung fibrosis and ARDS.
. Coagulation cascade proteinases in lung injury and fibrosis. Proc Am Thorac Soc 2012;9:96–101.
. Endothelial barrier protection by activated protein C through PAR1-dependent sphingosine 1-phosphate receptor-1 crossactivation. Blood 2005;105:3178–84.
. “Role reversal” for the receptor PAR1 in sepsis-induced vascular damage. Nat Immunol 2007;8:1303–12.
. Alveolar fibrin formation caused by enhanced procoagulant and depressed fibrinolytic capacities in severe pneumonia. Comparison with the acute respiratory distress syndrome. Am J Respir Crit Care Med 2000;161:454–62.
. Absence of proteinase-activated receptor-1 signaling affords protection from bleomycin-induced lung inflammation and fibrosis. Am J Pathol 2005;166:1353–65.
. Proteinase-activated receptor-1, CCL2 and CCL7 regulate acute neutrophilic lung inflammation. Am J Respir Cell Mol Biol Published Online First: 23 Aug 2013.
. Increased local expression of coagulation factor X contributes to the fibrotic response in human and murine lung injury. J Clin Invest 2009;119:2550–63.
. Pulmonary epithelium is a prominent source of proteinase-activated receptor-1-inducible CCL2 in pulmonary fibrosis. Am J Respir Crit Care Med 2009;179:414–25.
. Ligation of protease-activated receptor 1 enhances alpha(v)beta6 integrin-dependent TGF-beta activation and promotes acute lung injury. J Clin Invest 2006;116:1606–14.
. Role of protease-activated receptor-2 in idiopathic pulmonary fibrosis. Am J Respir Crit Care Med 2011;183:1703–14.
. A placebo-controlled randomized trial of warfarin in idiopathic pulmonary fibrosis. Am J Respir Crit Care Med 2012;186:88–95.
. Protease-activated receptor 2 mediates eosinophil infiltration and hyperreactivity in allergic inflammation of the airway. J Immunol 2002;169:5315–21.
. Vorapaxar in the secondary prevention of atherothrombotic events. N Engl J Med 2012;366:1404–13. Contributors RJJ, AEW and RCC all contributed to drafting and editing the manuscript. Funding Funding was provided by the Medical Research Council (GO20026) and Wellcome Trust (097216).